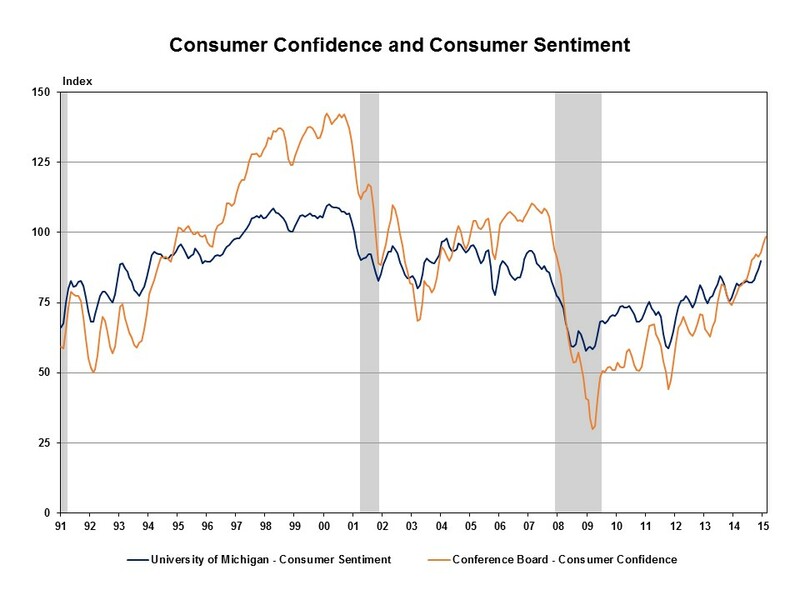 The University of Michigan Index of Consumer Sentiment reached a ten-year peak of 95.5 in the first quarter of 2015. Although the Index of Consumer Sentiment Index decreased to 93.0 in March from 95.4 in February, it was up from 80.0 from March 2014. The harsh winter dampened the giddiness of falling gasoline prices from the start of the year. Lower income households reported a loss in confidence because they are more sensitive to higher utility costs and disrupted work hours. The Conference Board Confidence Index increased in March to 101.3 from 98.8 in February. The March increase was driven by the improved short-term prospects for employment and income. However, consumer assessment of current conditions declined for a second consecutive month, suggesting a softening in first quarter growth. The share of consumers expecting more jobs increased in March, and the share anticipating higher incomes increased from 16.4% to 18.4% in March. Rising consumer confidence and improved job creation numbers are positive indicators for both improved GDP growth and housing demand once the economy clears the first quarter.